A little girl holds up chocolate that she is giving to her father. Photo Courtesy of Zamza's Homepage. On Valentine’s Day in Japan, women give chocolate to men they love. It is not the custom for men to give women gifts. On Valentine’s Day, women go to their schools and workplaces with beautifully wrapped chocolates. Apparently the Japanese custom of giving chocolates on Valentine’s Day started when a chocolate company had a sale at a department store on Valentine’s Day in 1958. The following year, heart-shaped chocolates were sold with a flyer saying “from a woman to a man.” By the mid-1970s, most Japanese thought of Valentine’s Day as a day for a woman to express her love with a gift of chocolate. 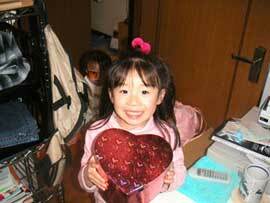 Currently, Valentine’s Day accounts for twenty percent of the chocolate consumed annually in Japan. Many women give Valentine chocolate not only to their romantic interest but also to their male friends, work colleagues and business partners, as well as fathers and brothers. Chocolate that goes to the man a woman really loves is called “honmei (‘real target’) chocolate” and the chocolate that goes to other men is called “giri (‘duty’) chocolate”. At some workplaces, women may save money by collectively giving giri chocolate to their bosses and other male colleagues.